This lasagna is perfect for the spring when asparagus is in season. This is a tasty lasagna. Perfect for a large gathering. 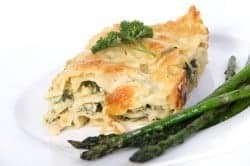 Enjoy this well-known Asparagus Lasagna tonight. Roast asparagus in a small amount of olive oil in oven at 400 degrees for 15 minutes. Make the white sauce with the next six ingredients. Mix eggs, and Ricotta cheese together, and add this to the white sauce. Cook lasagna noodles as directed on package, and coat the noodles with sauce, and lay in a 9 by 13 inch casserole that has been coated with Pam. Chop chicken and asparagus, spread over the noodles, sprinkle with Parmesan cheese. One layer of noodles and repeat. Top with noodles, sauce and mozzarella cheese. Cook at 400 degrees for 30 minutes. Serve after casserole has sat for 15 minutes. Toping of red sauce and sprinkle with Parmesan cheese. In a quart sauce pan saute onions and carrots in butter. Stir in tomatoes, basil, salt, pepper, and sugar. Cover and simmer for 15 minutes. Puree in blender until smooth. Return to saucepan, and chicken stock and reheat. This is a lot of work, but it taste wonderful. You will need to use a larger pan 2 1/2″ deep will work a lot better. The Marinara Sauce needs to be thicker, we used corn starch. You should split the chicken, cheese, and asparagus into thirds before you start to lay the layers out. We also but sauce on the bottom before the first layer of noodles. This is a very lite tasting Lasagna. We are going to try freezing the leftovers. This recipe will serve 12 large servings. Thank you for your suggestion, I will see what I can do about modifying the recipe.